Our Tactical Slingshot blasts ammo down range with accuracy. Features include high quality thrust bands, leather pouch, and a built-in BB magazine for rapid reloading. An adjustable wrist brace and the integrated and adjustable sight will assist you in hitting your target time after time. Includes a set of 30-count 3/8 in. BBs. I have Possums trying to eat my chickens, I can give them some serious bruises and awful headaches with my new weapon from the back porch. Great buy. Very happy with my purchase. 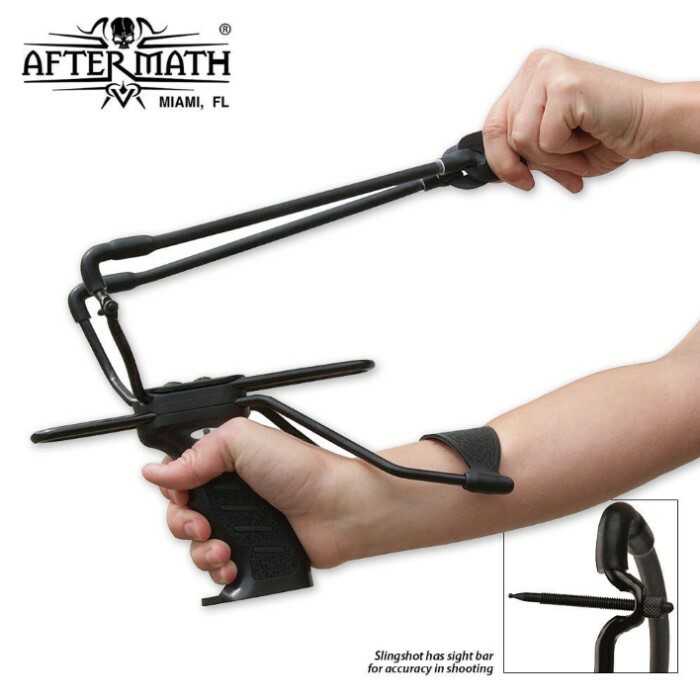 Best sling shot I have seen for 17.99 great buy has reload in the handle and sight on the front and Bad**s looking too. The sight bar is a bit hard to install but the magazine system and wrist guard work very well. The wrist guard and sling V are very easy to adjust. I enjoy taking my sling out on hikes and betting on hitting trees that are about 6 inches wide from 30 yards! I use air soft BBS and they work extremely well. Overall a good product in my eyes.